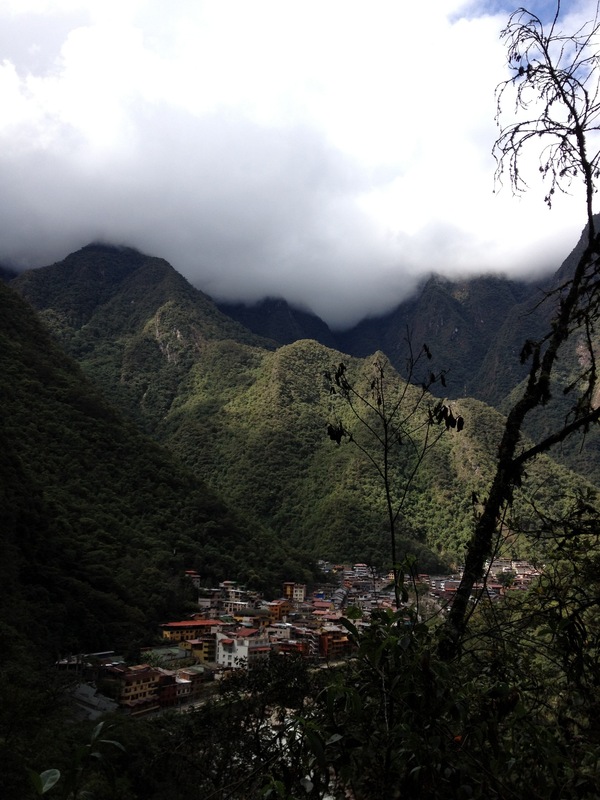 After a day of climbing around Machu Picchu, hiking to the Inca Bridge, and then through the many many terraces of the little stone village itself, we had a day to spend exploring Aguas Calientes, the actually-occupied village far below the Picchus. So we decided to look for another hike to take. The tourist office informed us there were no such hikes, but the Internet said otherwise, and we decided to trust the Internet. 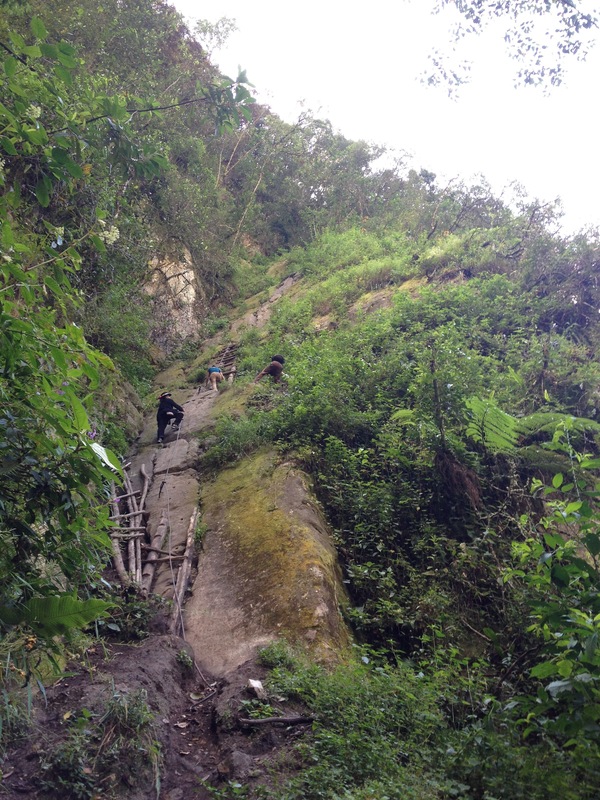 Supposedly, this trail would lead to the top of Mount Putucusi, from which we could look down on Machu Picchu. First, we had to follow the road out of town, and then follow the train tracks farther. Technically, it is very illegal to walk on the train tracks; however, train tracks are pretty much the only roads available, and the locals don’t seem to know how many laws they are breaking as they walk, bike, push wheelbarrows, and take large groups of tourists down these same tracks. So we walked over the train bridge, knowing that if we saw the train tunnel, we had gone too far. Fortunately, the trail itself was pretty easy to spot. It led up into the foliage, just prior to the big warning sign which I couldn’t read. 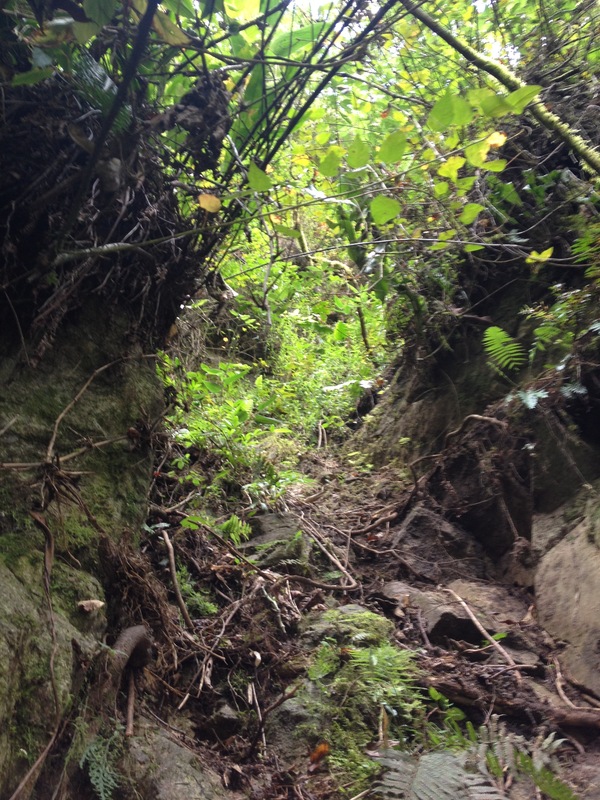 Off we went, up stone stairs cut into the underbrush. The trail (staircase?) wove back and forth, through thickets, around trees, and up the mountain. 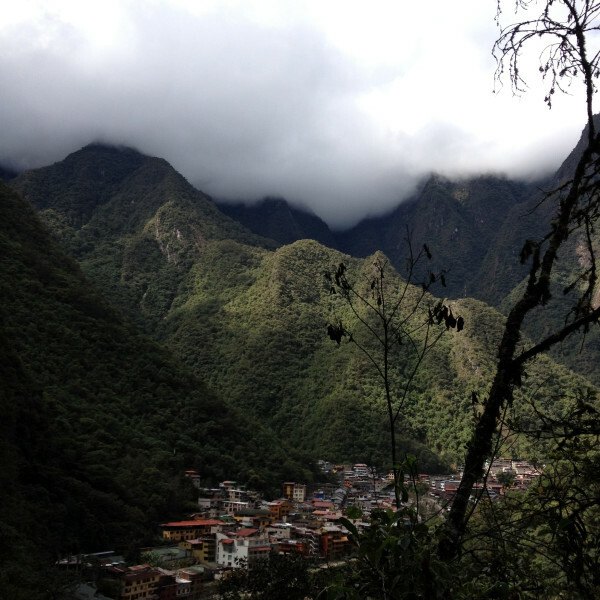 At a certain point, it topped out, allowing us an amazing view of the mountains around, and the small village of Aguas Calientes nestled in between them. And then it went back down. Odd for a trail destined to lead us to the top. But down we went, and then up again. And winding around one zig-zag path, 15 feet above us, we encountered a Peruvian leprechaun. That’s what we later decided to call him, anyway. He was wearing a Peruvian hat, multiple colors, and carrying a small pan flute, from which he cast haunting mountain spells, or summoned his fellow road-thieves. It was hard to tell what was going on. So we asked him if the way forward was safe. He nodded, and then made some hand gestures for climbing up ropes. Okay, we thought, let’s see what this is like. On we went, until we found an impassible section, traversable only by a wooden ladder propped against a rock. The wooden ladder had long since fallen into disrepair. 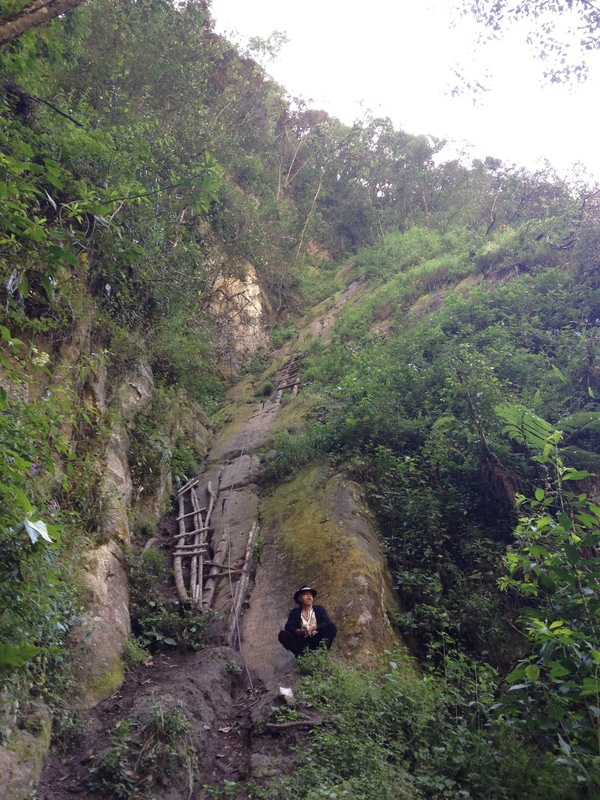 The Peruvian leprechaun, at this point, having followed us, decided to show us the way up. So up he scrambled. We were cautious, but eventually followed his lead, holding onto a conveniently fallen tree, the remains of the ladder, and parts of the underlying rock itself. Not that bad. By the time we got to the top of the ladder, though, our Peruvian friend was gone. He was waiting for us at the next broken ladder. This one had been partially replaced by a very long cable, bolted into the rock. It had to be something like 100 feet tall. The Peruvian man sat perched on a small rock at the bottom, showing no reaction to our puzzlement and disbelief. We contemplated the scene in front of us for a while, and then decided to search for an alternate route. There had to be an alternate route, right? We plunged further into the brush in search of one. But while we were plunging around, a young couple we had met in Cusco came along and decided to give it a try. We returned to find them half-way up, and stuck on the piece of ladder that remained in the middle, completely cut off from the top and bottom. The Peruvian man was playing his flute. And then he apparently either got tired of watching these foreigners, or decided to show them the way. So up he scrambled, hand over hand past them, and disappeared into the bushes at the top of the cliff. That was the last we saw of him. But we decided to stay and see how our fellow travelers fared. After another twenty minutes of struggling with the ladder, they turned around and spent a harrowing 15 climbing back down. “Too risky” they told us, when we greeted each other at the bottom. I figured that if they had gotten halfway up and had THEN decided it was too risky, they probably knew what they were talking about. But our new friends were keen to search out a new path with us. So we all trudged back into the bushes to see what we could find. This one was small, only 15 feet or so. And someone had conveniently prepped our journey by pulling free a long root that we could use as a rope, and looping a branch around a tree, that we could use as a handhold. I was not confident in my abilities to climb this - period - let alone climb it with a heavy backpack, the need to get back down at some point, and a looming train schedule we had to meet. I was happy to rule out rock-climbing on this trip, and stick to long-distance hiking, and braving hostels that did not see the importance of providing lighting, towels, soap, or toilet paper. But up our friend went. He seemed to pull it off pretty easily, but his female companion struggled with it. This was a bad sign - if a small, agile female wasn’t able to easily pull herself up a tree branch-root combo, then I probably wasn’t going to be able to either. She did make it, however. Then Josiah went up. Then I took my turn. Half-way up, okay. The rest of the way involved me having no footholds, and trying desperately to dig out a barely exposed root with my fingertips, so that my root-gripping right hand would have some company in allowing me to continue to dangle over empty space. That’s when a large rock came whizzing over the side, right past my face, hitting me in the arm which was supporting my entire body weight. Eventually, I was able to grip a root, switch to a bigger root, and put my arm around the small tree that was making this whole adventure possible. I dangled there a moment, my arms the only thing holding me, and I hugged the tree while my feet swung. And then I somehow converted that hug into a much less appropriate embrace, and made my way to the top of the cliff. I think the only way I was able to pull off such a maneuver was with a quite intense surge of adrenaline. This left my whole body shaking, including my arms, legs, and my very tired hands. Either that, or I was just traumatized by the experience of knowing I was about to fall off this cliff face, and into the forest below. Did I mention that as I was dangling, some of my fellow-travelers accidentally hit me with a large rock? To another one. 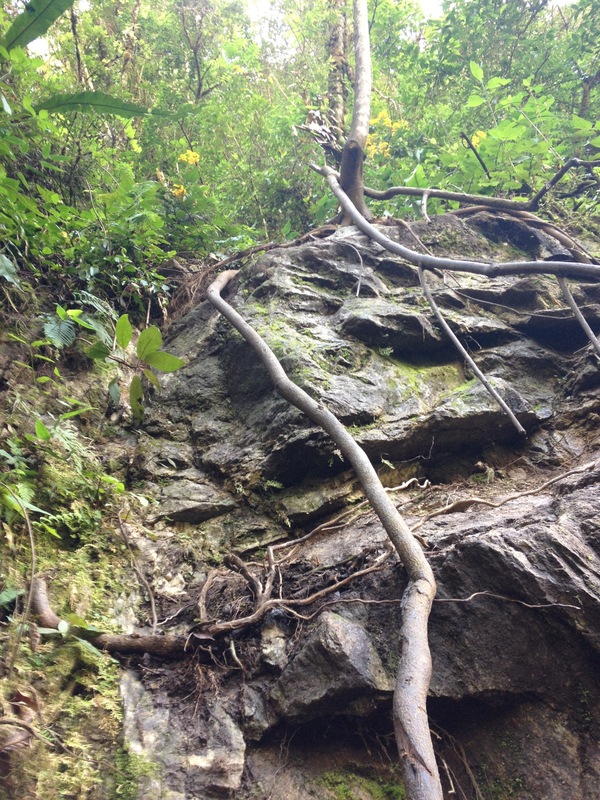 This one was simpler, involving walking along the outside of an improvised tree root staircase. I am not generally enthusiastic about staircases in which you must grip a wall and the stairs are not beneath you. But we made that. And then we climbed further along this steep pathway, and came to a ravine which desired to be clambered up, and yet did not provide the courtesy of walls which could be clambered. I was halfway up when my grip, the only rock I could find to hold, came loose. I was done. My arms and legs were shaking, and most significantly, my tolerance for confronting heights, fear, and the sensation of falling, was gone. I came back down. If we had confronted these obstacles in reverse order, it probably wouldn’t have been that bad. But I was not up for facing a never-ending series of these, each one even more difficult to return from. Being a wimp as a kid turns you into an adult who does not want to back down from anything. So once I commit to something, I rarely give up. Wanting to be macho usually kicks in just long enough to get me over the hump. But I wasn’t ashamed of this. I was finished. Our friends continued on, while we headed back down. When we made it back to the first obstacle, we were greeted by some other hikers at the bottom of the cliff. They saw the cliff we were climbing off of and immediately gave up. And before we finished getting down, our friends returned as well. Right above the part I had given up on, they had found another giant rock wall, with no grips, roots, or ladders. They had faced the insurmountable just beyond my limit. There’s probably some lesson to be learned here. But I have yet to learn it. I simply decided that I had reached my limit, and turned around and came back. And I don’t regret that. Although I do wonder what might have happened if we had managed to follow that Peruvian leprechaun up the mountain. See more of these photos. What MIGHT have happened????? What WOULD have happened is that the "leprechaun" would have shown you has magical hide-out and taken you into a world very different from ours...Or maybe just the top of the mountain...you can never be sure with such things. Even though I'm sitting here in the comfort and safety of my home, my stomach feels like it was going with you up the mountain! Great blog and great photos!! Micah, you made the right choice. In the future in similar situations remember two things. First, acting "macho" is usually the wrong thing to do. Second, as the old saying goes : discretion is the better part of valor . I guess the air conditioned bus up the freshly paved road wasn't running that day. Haha! I think you're thinking of Machu Picchu, which does have a bus running up a good chunk of it. If Mount Putucusi has that, nobody showed me!